Caption slip reads: "Photographer: Parkinson. Date: 1952-04-06. Reporter: McHenry. Assignment: Shooting at 817 78th Street. Suspect - Henry Stanley Blythe and his divorced wife Betty Blythe. Sgt. 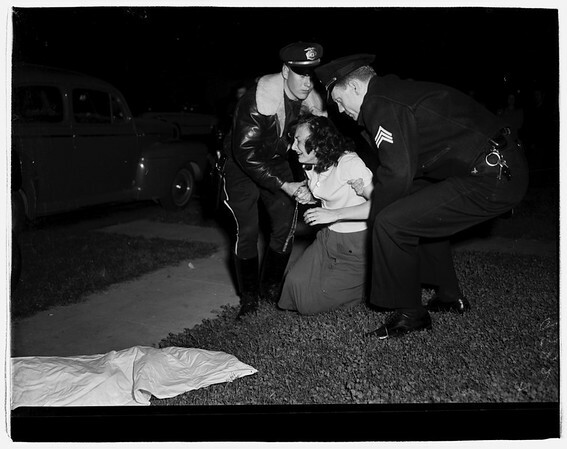 J. J. Minouge (nearest camera) lifting Betty Blythe who had just collapsed near body of man her ex-husband shot. Detective Marvin Jones and body of John Wilson".